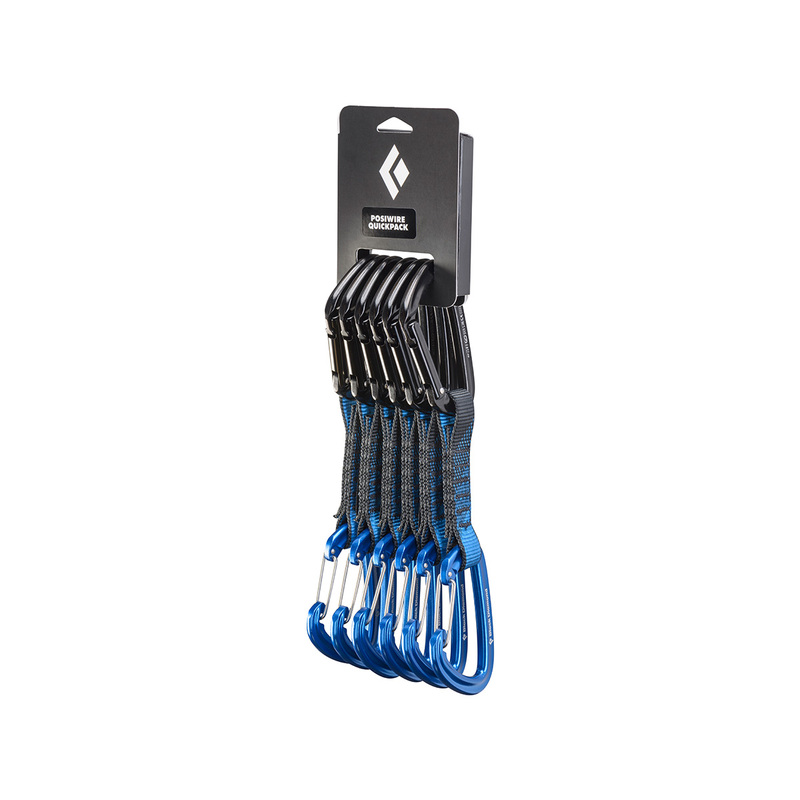 The Black Diamond PosiWire Quickpack is a combination of the easy-clipping Positron carabiner and the lightweight, versatile HotWire carabiner for maximum efficiency and performance on all ranges of climbs. The Black Diamond PosiWire Quickpack is quipped with a Positron carabiner on the top for easy clipping and cleaning and a Hotwire carabiner on the bottom to minimise gate flutter and chances of freezing, it's ideal for a range of climbs, while the 18mm Dynex sling features Black Diamond's signature Straitjacket insert to keep the bottom 'biner in the right position. Per il prodotto c'è poco da dire il marchio è comunque una garanzia. Sono molto contento della spedizione che è arrivata in pochissimi giorni in Sardegna e con il prodotto ben confezionato visto l'utilizzo per il quale è destinato. Not the lightest on the market but are reasonably priced and as always from Black Diamond look the part too. I've been using them for sport climbing the chunky slings boost confidence when working on hard routes. Wiregate makes it easy to clip and the draws are very easy to be doubled up when needed to reduce rope drag over rock features. The rubber to keep the wire gate carabiner in place has so far worked well it appears to be very durable. Downside is the weight but other than that these are a groovy set of draws which I am more than happy to use. Would definitely recommend them. Considering Pro and Cons... I bought 2 packs of PosiWires. They are good enough and cheaper than many others. - I love their W.I.D.E bottom biner. Some time ago I bought micro-wire but kept getting my fingers jammed inside! - last but not least... they are CHEAPER than others! - they are pretty heavy. 103g each. I have 15 on my harness, which makes me 1.5 kilos heavier. - bottom biner has a nose, which could cause nuisances to the second climber. The most beautiful quickdraws I've ever seen! And does the job, nothing special.